There is a curious tradition behind towers in Italy. Even though on the surface of it they may look like simple defensive lookouts, in fact, in the bel paese they were used for many centuries as residential buildings. Yes, rich families would build towers to live in them protected from foreign and local enemies and the wrath of the populace. I was once told that Vicenza used to have over 100 towers during its medieval peak. Only a handful of those have survived to our modern times. Its very central location at Piazza delle Erbe ensures that everyone who visits Vicenza passes by it at one moment or another. Often though the tower doesn’t even register on people’s radar, as it is attached to the back of the rather splendid Basilica Palladiana – the jewel in Vicenza’s architectural crown. Overawed by the beauty of the Basilica, which is Andrea Palladio’s most feted building, few stop to think and enquire about the brick tower behind it. in its own right which deserves to be told. The tower was originally built in the 12th century by the Carnaroli family to use as a residence. To protect the family, it was initially surrounded by a deep moat beyond which stood the shops of the local artisans. The moat inspired the other name under which the tower is still known to this day: Torre del Girone, girone meaning a ’round’ or ‘circle’ in English. a repository for the civic archives and registry. (nowadays the Basilica Palladiana). The name Zavatteri apparently was derived from a local word for ‘shoes’ or ‘slippers’, as right underneath the arch there used to be a footwear market at the time. Unfortunately, on 19th June 1509 the original tower was almost demolished in a fire, which had been started to destroy compromising documents. The archives did not survive the flames. The tower was consequently re-built and from 1656 to the end of the 19th century it was used as a prison again. the Tower of Torment and have usually found it impossible to do it justice. No matter how much I tried to maneuver the angle, usually I would include in the photo a large piece of the splendid Basilica Palladiana which would detract completely from the tower. Plus, there are usually quite a few cars parked at Piazza delle Erbe which made it even more difficult for me to pick the right spot so as to accommodate if not all, then at least most of the tower’s brick body in my shot. Finally, this week, almost by chance, I managed to get a photo I am perfectly happy with. Tower of Torment plays the main role. The sky is that perfect blue that only an Italian sky can achieve even though it is not summer anymore. And, my newly acquired photo processing skills helped me get much crispier than usual lines which make the tower seem to pop out of the frame (or so I tell myself). So, here it is. The Tower of Torment. Eight centuries of history and still standing tall. 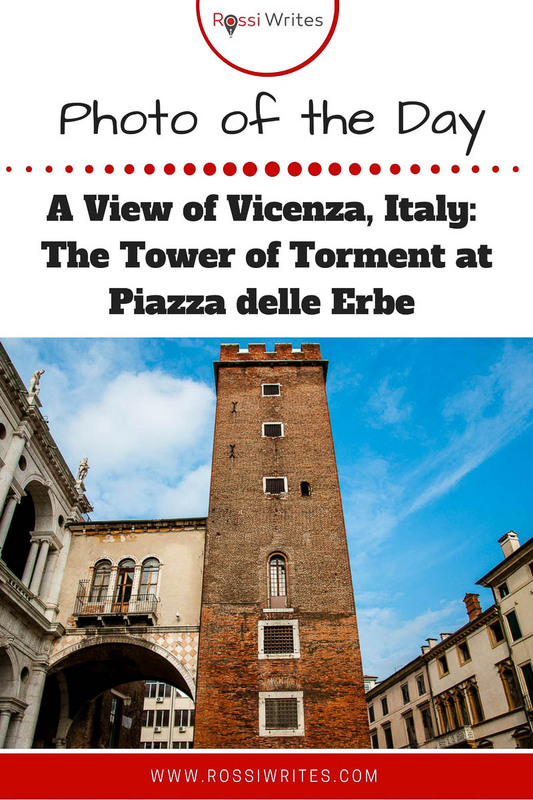 Which lesser known sight in Vicenza intrigues you with its history and appearance? Let me know.